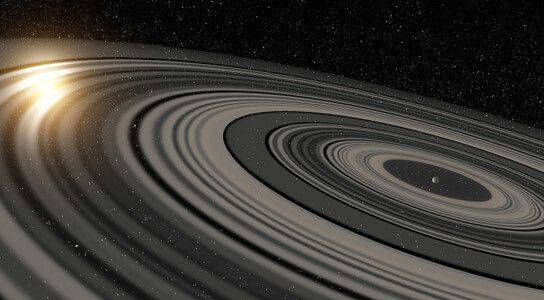 A new study from astronomers at the Leiden Observatory reveals details about the gigantic ring system around J1407b. Astronomers at the Leiden Observatory, The Netherlands, and the University of Rochester, USA, have discovered that the ring system that they see eclipse the very young Sun-like star J1407 is of enormous proportions, much larger and heavier than the ring system of Saturn. The ring system – the first of its kind to be found outside our solar system – was discovered in 2012 by a team led by Rochester’s Eric Mamajek. A new analysis of the data, led by Leiden’s Matthew Kenworthy, shows that the ring system consists of over 30 rings, each of them tens of millions of kilometers in diameter. Furthermore, they found gaps in the rings, which indicate that satellites (“exomoons”) may have formed. The result has been accepted for publication in the Astrophysical Journal. The astronomers analyzed data from the SuperWASP project – a survey that is designed to detect gas giants that move in front of their parent star. In 2012, Mamajek and colleagues at the University of Rochester reported the discovery of the young star J1407 and the unusual eclipses, and proposed that they were caused by a moon-forming disk around a young giant planet or brown dwarf. In a third, more recent study also led by Kenworthy, adaptive optics and Doppler spectroscopy were used to estimate the mass of the ringed object. Their conclusions based on these and previous papers on the intriguing system J1407 is that the companion is likely to be a giant planet – not yet seen – with a gigantic ring system responsible for the repeated dimming of J1407’s light. The light curve tells astronomers that the diameter of the ring system is nearly 120 million kilometers, more than two hundred times as large as the rings of Saturn. The ring system likely contains roughly an Earth’s worth of mass in light-obscuring dust particles. PDF Copy of the Study: Modeling giant extrasolar ring systems in eclipse and the case of J1407b: sculpting by exomoons? 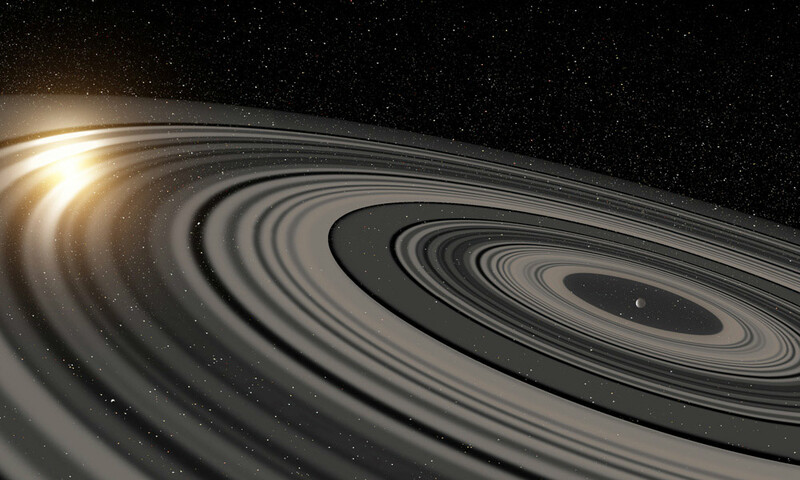 Be the first to comment on "Ring System Around J1407b is Roughly 200 Times Larger Than Saturn’s Rings"